Advertiser.ie - Win a meal for two to the value of €55 at The Skeff! Win a meal for two to the value of €55 at The Skeff! 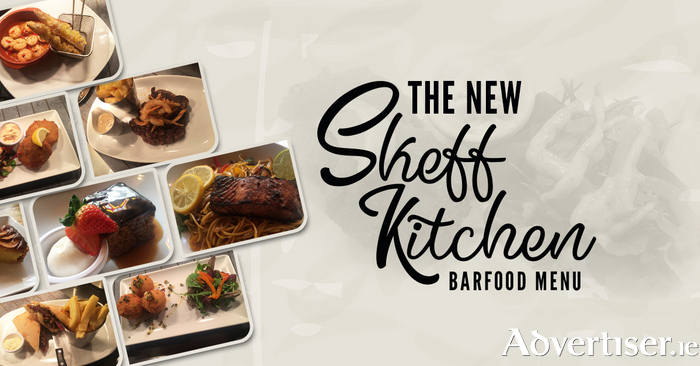 Their chef has been busy developing an exciting new menu at The Skeff, and it’s amazing. To celebrate this they would love you to WIN A MEAL FOR TWO to the value of €55. Their amazing menu includes everything form prawns to penne and from beef to brownies, you will have trouble making your selection. But then, you can always come back another time if you don't win this delicious prize! At The Skeff, they have created an imaginative new menu that has something for everyone. They only use the finest fresh ingredients in all their dishes and they source locally where possible. Their menu is coded so that you can be assured of selecting dishes that are gluten free, dairy-free, nut-free etc. Their expert servers will also be able to assist you with your choices. To be in with a chance to win this fantastic prize simply answer the question in the form below. Closing date for entries is Friday 2nd of June 2017. 1. The prize is for a meal for Two to the value of €55 at The Skeff Late Bar & Kitchen. 2. Once selected, the winner will be contacted by the Galway Advertiser to arrange delivery of the prize. 3. Entries must be entered online in the form above. 4. Entries not submitted in accordance with these rules will be disqualified. 5. Entry to this promotion shall be deemed full and unconditional acceptance of the terms & conditions. 6. The promoters reserve the right to amend these terms and conditions. 8. The closing date for entries is Friday 2nd of June 2017. Skeff Late Bar Facebook Fans Will Have No Regrets About Their Greatest Day!